There were so many things happening in Hudson NY on May 5th that I almost forgot that it was Cinco de Mayo - a celebration of Mexican heritage and their pride in the fact that their puny army defeated the more sophisticated French army at the battle of Puebla on May 5, 1862. So that's why we drink frozen Margaritas and eat guacamole and chips all day. Maybe a mint julep too - after all, it was Kentucky Derby day as well . I digress. First thing in morning - which for me means around 10:30 or 11am - I went to the Farmer's Market, open in its permanent outdoor location for the first time this year. While not yet overflowing with goods, the market had a nice selection of fresh, local products. Actually, I picked up assortment of groceries that will take me through several meals this week.
. Assorted salad leaves, and a bag of assorted spicy sprouting leaves from North Star Farm.
. A big hunk of Adirondack Cheddar from Cheese!
. Quinoa bread from Loaf. I had enough food to make interesting salads, tangy grilled cheese sandwiches on the friable quinoa bread whose crumbs load up with cheese and become other-worldly, chicken for many meals cooked in several ways - and, dinner; grilled sausages with tomato sauce and roasted baby bok choy. I still haven't picked up gas for my outdoor grill - so I grilled the sausages in a grill pan - which does a real nice job but makes an ungodly mess in the kitchen as the fine mist of fat coming out of them knows no bounds. While the sausages grilled, I roasted the bok choy, rubbed in olive oil and sprinkled with coarse salt, in a thoroughly preheated 400 degrees F. oven for about 20 minutes or until the leaves were almost charred and the bulbs were tender. Be sure to rinse the bok choy in copious amounts of water over, and over again. The leaves near the root hold lots of teeth-chipping pebbles. I try to keep a container of my simple, go-to tomato sauce ( saute garlic with a bit of hot pepper in olive oil, add hand-crushed pelati - peeled Italian plum tomatoes of the highest quality - and a shower of your favorite herb - I choose dried oregano in the chillier months) in the fridge at all times for emergency meals of spaghetti al pomodoro or a simple pizza. Or, as in this meal as a sauce for the sausages. I purposely buy sweet sausages when I really like spicy because I like to add my own fresh (from the freezer - but grown by me last summer) little Thai peppers and a few fennel seeds to the (already made) sauce that will eventually nape them and lend multi-dimensional flavor. I garnished the dish with quinoa toast triangles because I find them irresistible - but Loaf's walnut bread is a very close toast runner-up. The Farmer's Market, a children's book fair (which I did not attend), and the 2nd Annual Ramp Fest held in at the Basilica were the major events of 5 May 2012 in Hudson. I loved every bit of ramp-included food that I ate - which was about 7 different things - even although there were maybe 15 or so food establishments offering their finest interpretations of the ramp. I arrived at the event - billed as noon to 4, at 1:30 - about 5 places had already exhausted their supplies. Note to self - get there at noon next year. This is what Gabriele Guglielmetti, Rachel Sanzone (pictured), and Sissy Onet of Loaf offered. By the time I reached their table, I got some beer battered deep fried ramps. That's all that was left. They were wonderful. More please. I couldn't have written my guidebook, Shopping in Marrakech (yes, the same city spelled in different ways ) without the extraordinary help of Maryam Montague. 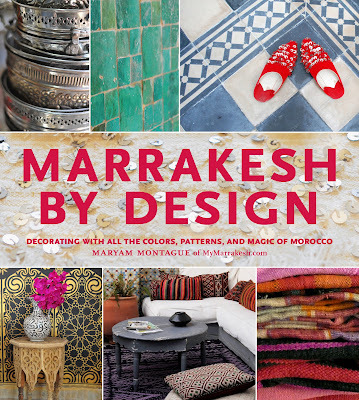 Her own book - that will help you bring the dizzyingly colorful and intricate design of Marrakesh to your home - has just been published and she's touring the US talking about it and signing copies. ATTENTION friends in California and New York go here to find out when she'll be at a venue near you.